New visuals designed to make the on-screen experience more aesthetic and beautiful. A mini-player within the app with key functions to reduce need for maximizing it. The visual changes are mainly during album play, when the background discerns key album art colors and matches. The effect is an integrated hue that exists in many iOS apps. (Rhapsody’s v5.0 is Android-only for now; an iOS refresh is coming.) The effect is appealing. The “New for you” recommendation page was of particular interest in a test account that has 14 years of Rhapsody history. We found the suggestions interesting, suitably wide-ranging in an account which has roamed across music genres and styles, and not without some head-scratchers. It was unclear why Eminem would be surfaced near the top, but perfectly clear why world and blues artists got screen time on that page. We noticed many compilations were featured, as opposed to single-artist albums, and several EPs. Overall, the music discovery on “New for you” was worthwhile. The mini-player, which stretches across the bottom of the app, is more useful than before, enabling saves of new discoveries with a single tap. 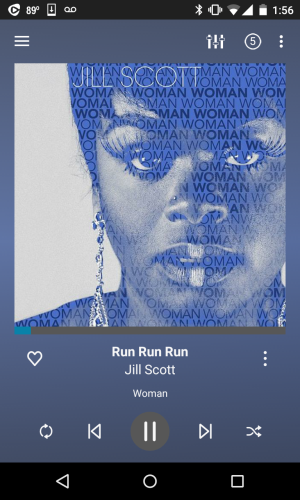 The “like” icon (a heart) is positioned on the mini-player now, so touching that throws a track into one’s personal library. It is also newly swipe-able, so skipping through tracks of an album or playlist can be done with a quick thumb movement — not need to even look at the screen once you get the hang of it. Rhapsody is the great-uncle of music services, founded in 2001 as a subscription-only platform for its entire life. Its companion Napster brand, offered in some geographic regions, is also updated in this Android app refresh. Last week the company reported three-million global subscribers. In March, Rhapsody introduced “audio cards” which brought full-song streaming to Twitter.